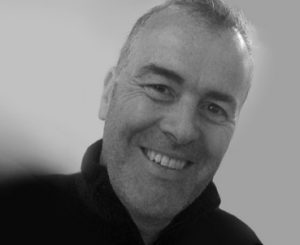 A white paper outlining a new theory of fundraising ethics is published today by Rogare, the fundraising think tank at Plymouth University’s Hartsook Centre for Sustainable Philanthropy. The new theory states that fundraisers owe duties to both their donors and their beneficiaries, because both stakeholders possess certain rights they hold against fundraisers. However these rights sometimes come into conflict: ethical dilemmas in fundraising therefore occur when there is tension between what donors want fundraisers to do (ask less, in different ways or at different times, or not at all) and what beneficiaries need fundraisers to do (maximise income to provide services). Fundraising is ethical when it balances the duty of fundraisers to solicit support on behalf of their beneficiaries, with the right of donors not to be subjected to undue pressure to donate. For example, a fundraising campaign that repeatedly solicits donors who had requested not to be contacted would be unbalanced, and therefore unethical, because they would not be protected from unreasonable intrusion into their privacy nor unreasonably persistent approaches (both prohibited by fundraising’s applied ethics contained in the Code of Practice). But regulation that prevents fundraisers from contacting vast swathes of people could also be unbalanced, because it could significantly harm beneficiaries, and if it did, would therefore also be unethical. “For such a fundamentally important topic, there has been surprisingly little theory development of fundraising ethics over the past 25 years. ‘Service of Philanthropy’ – fundraising is ethical when it brings meaning to donors’ philanthropy. 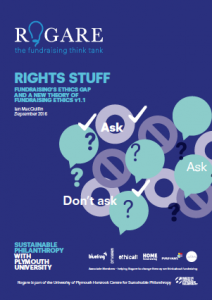 The white paper – Rights Stuff: Fundraising’s ethics gap and a new normative theory of fundraising ethics – is just the first part a full review of fundraising’s professional ethics that is expected to take at least a year. 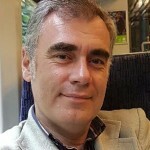 Next steps in the review include a global survey of the existing ethical decision making processes fundraisers currently employ, and elaboration and development of the ideas presented in the white paper by the projects advisory group of academics and fundraisers with a background in philosophy. The review will also include a new project that will apply Rights Balancing Fundraising Ethics to the question of how beneficiaries are ‘framed’ in marketing materials. Rogare has already set up an exploratory meeting with Bond, the umbrella organisation for aid agencies, to scope out the terms of this project. “The framing debate has become unhelpfully adversarial. Fundraisers are accused of exploiting ‘beneficiaries’ – even that word has become contentious. Meanwhile fundraisers accuse policy folk of getting angry about fundraising images instead of angry about the injustice that good causes seek to address. We are also in early discussions with another representative organisation about applying Rights Balancing Fundraising Ethics to their particular field of fundraising. Find out more about Rogare’s review of fundraising ethics.